Mount Whitney, home to the highest summit in the contiguous United States offers climbers the opportunity to walk up to its peak, or attempt a more technical route. 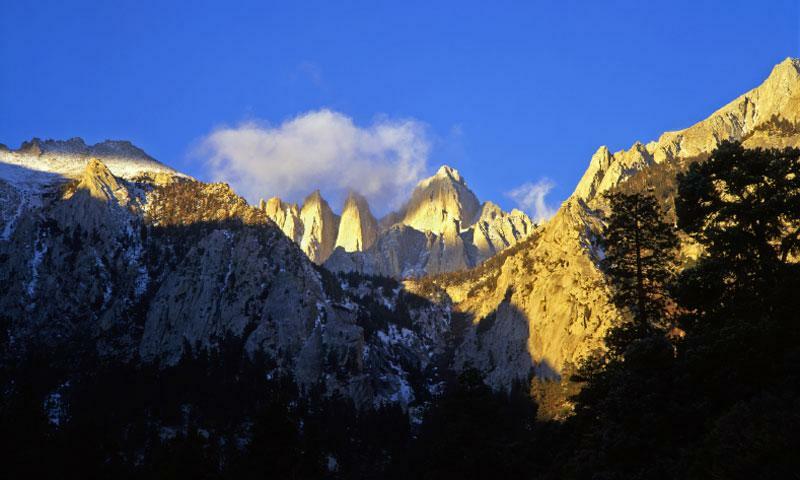 Mount Whitney straddles two national parks: Inyo and Sequoia. The most common route to the summit is Mount Whitney Trail, at a round trip of 22 miles. More adventurous hikers can attemp "The Mountaineers Route," a class 3 scramble. Consider hiring a guide for the most rewarding experience. Mount Whitney, home to the highest summit in the contiguous United States with an elevation of 14,505 feet, offers an adventure like no other peak in the Sierra Nevada. Mount Whitney is located in both the Inyo National Forest (its eastern slope) and the Sequoia National Park (its western slope). Access Whitney Portal from Lone Pine, CA. Travel west 13 miles to Whitney Portal Road. The trailhead is on the right side of the road. For most, summer is the season to visit Mount Whitney. During the winter, heavy snows and harsh weather keeps the crowds at bay, but for the adventurous (and experienced) winter summits are still possible. The Mount Whitney trail, with over 30,000 annual attempts, and 10,000 successful summits, is the most popular route to the top. The total hike is 22 miles, and includes 6,100 feet of elevation gain, all without any technical climbing. Wilderness Permits are required, and limited quotas are enforced from May 1 to November 1. Hikers must carry bear proof food containers from late May through October and pack out all human waste. The trail can be completed as a day hike; however, many take two to three days to complete the route. Find the trail 13 miles west of Lone Pine at Whitney portal. For those looking for a bit more adventure, but don’t want to attempt a technical climb, consider taking on “The Mountaineers Route.” Classified as a Class 3 scramble, the route includes “short sections of trivial climbing,” but no ropes or technical equipment will be necessary. “The East Face” is a classic high sierra route. The route involves some free climbing (Class 5.7) but is mostly class Class 4(meaning use of a rope is recommended). Whether attempting a walk up or a technical climb, Mount Whitney is a rugged alpine environment, and traveling its slopes comes with risk. Consider hiring a guide service to get the most rewarding experience. Mount Whitney is only 90 miles from the lowest point in the United States, Badwater Basin in Death Valley at -297 feet.